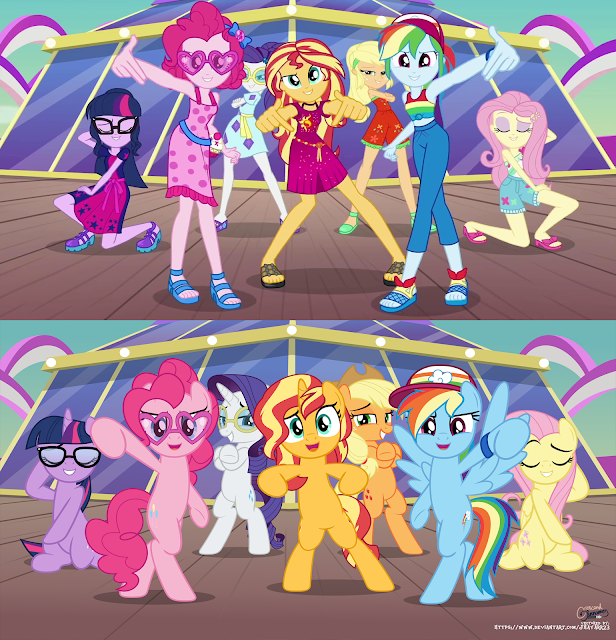 Humanized horses get more of that DWK treatment. Head on down below for a whopping 16 minutes of them in the third part in the Rainbow Rocks series. A spiritual successor and sequel to Haiku, Mane In Green's new heartfelt pony tribute is full of love. Imagining all the cuddly things happening between his two favorite ponies, Fluttershy and Rarity, Mane turned all that passion and inspiration into a gorgeous OST-like musical tribute, depicting Fluttershy's journey to find her beloved Rarity who went on a trip overseas. 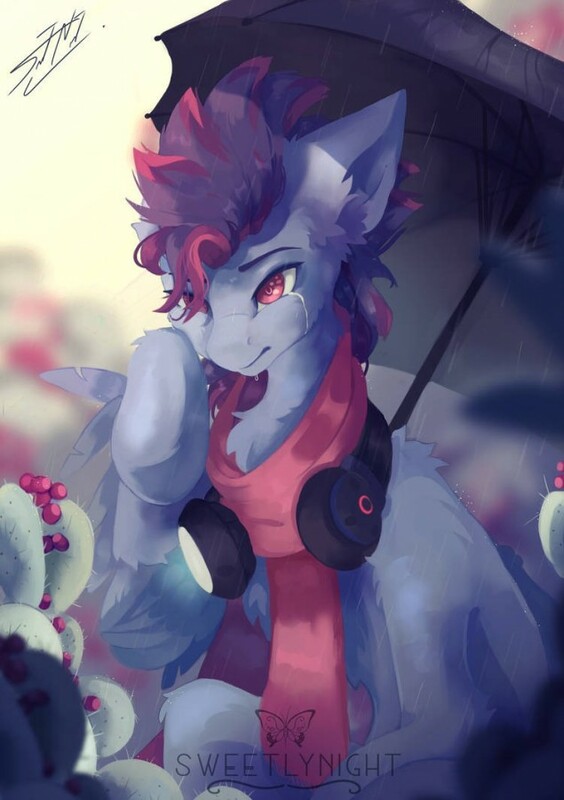 Much orchestral talent in the composition and melodies all around the track, much beauty in the instruments used, and most of all, much magic in the pony feelings that Mane has and that got him to make this song and artwork with love! A really cool edit if I may say so. Which one is your favorite? Evening guys! Hope you all had a great day! Ready to chat? 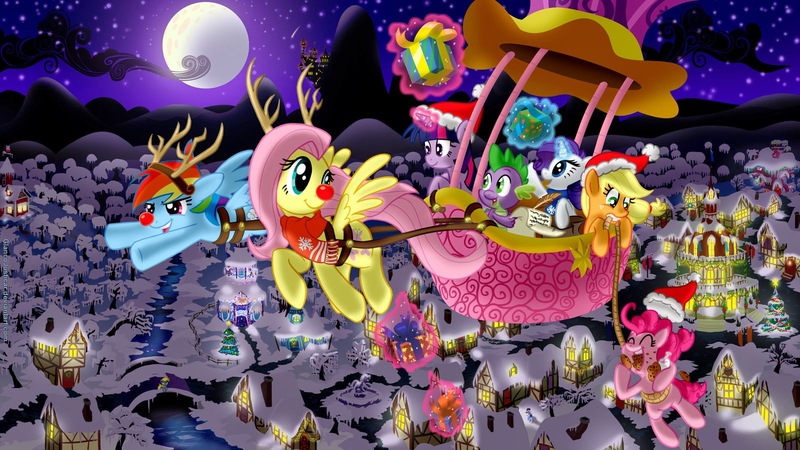 Discussion: What Holiday Still Needs to be Ponified in the Show? We've got Hearth's Warming Eve, Nightmare Night, and Hearts and Hooves day all being celebrated in a very pony-way over in Equestria, but earth has loads more they could pick up on for an episode or two. Which holiday would you like to see Equestria pick up next? How would the pony version of it work? Would You Be Interested in Episode Rewatches? Something we've played with a few times over the years leading up to new seasons has been episode rewatches, but we never made any real set-in-stone plan for it. A few people have mentioned wanting them to come back, and it sounds like it might be fun to nostalgia about those oldschool stories we all used to love. How many of you would be up for something like this? And what day do you think would work out best? Description:Twilight and Sunset race against the clock to save Canterlot from a foe of unimaginable power… a romantic narrative. Update time! Including an old one. It's like putting headphones on a horse. I don't know where I was going with that. Get art below. Dubbin comcic! We've got three today as always. Go watch below. 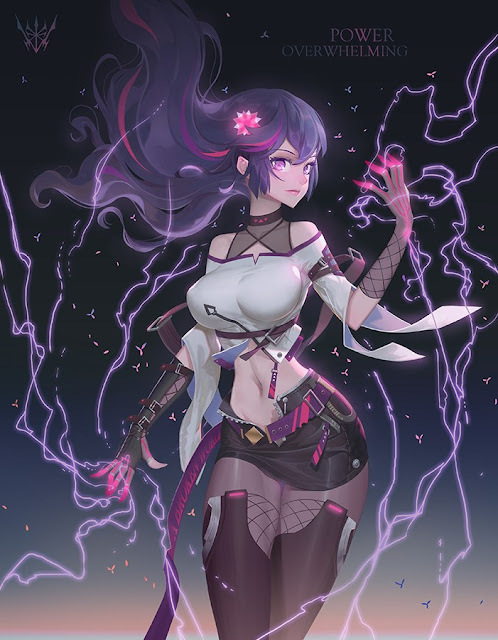 Last Day Reminder for G5 Open Art Event! This is your final day to draw your idea for a G5 pony! The event officially closes tonight. If you want to show off what ideas you have for a G5 design, this is your chance! Or just practice drawing horses. That's fine too. Submission info is over here. Good luck! 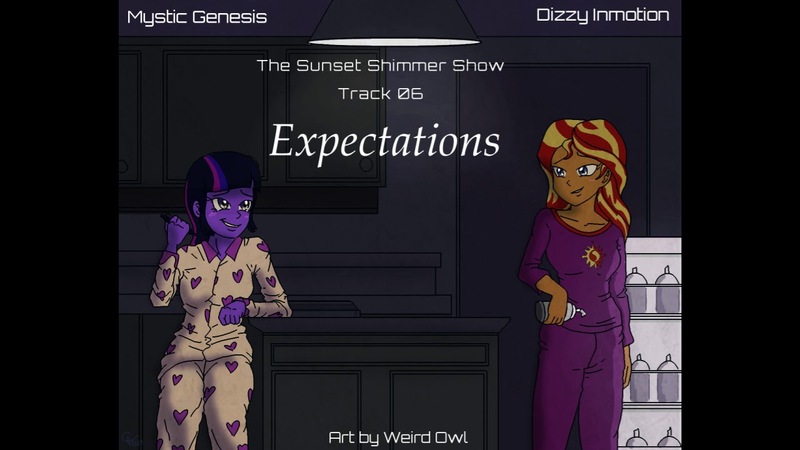 Full of Sunset Shimmer character depth, this new song from Dizzy's upcoming album is quite emotional, in its story and its vocals too. Dizzy is putting all his heart into it and you can definitely feel it in the vocals that express personal feelings as well, and the piano and guitar are such wonderful additions. Even if you're apologetic, you need to stand up for yourself still and make the right decisions, and this song and tribute shows once more how strong Sunset is. Let's send her and Dizzy all of our love and support, together! Mystic Genesis and DaWillstanator contributed once again to voice the other characters, and together they all created something quite beautiful and powerful, showing much passion! Comics: Security Installation / Olde Fuge Treble / Pone Wars #8,3 / Glim and Pals # ??? 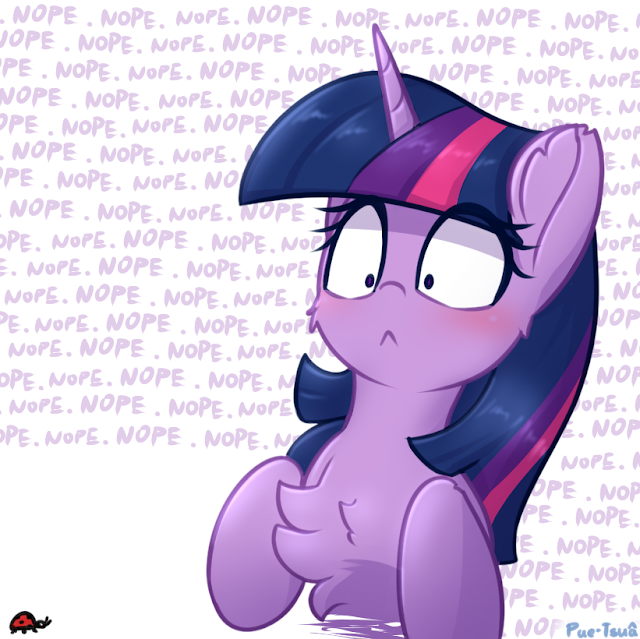 Twilight is serious about security. It's comic time. Get them above and below and click for full. Just Rarity showing Sweetie how wet mane works. She has to pass on that fabulousness to her little sister after all. Morning guys! Ready to start a new day? Ther full version of the Rainbow Wings Twilight Sparkle from a few days ago has arrived from the Australian version of Hasbro's Youtube presence. Right now, it's pretty much all just a toy commercial. Where it will go from here is still a mystery, but it's definitely not the same toy as was announced tying into the Rainbow Roadtrip special. You can find it down below! That one timeline where your mechanic is a horse. And he still ripped you off. 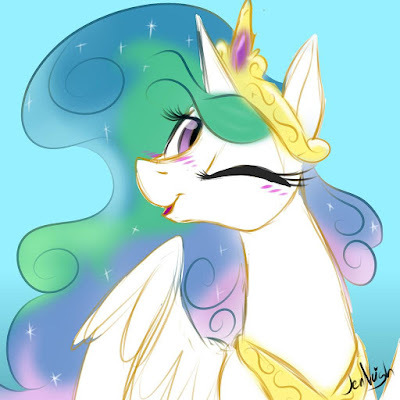 If Celestia gives you a flirty wink, what do you do? Give her one back? 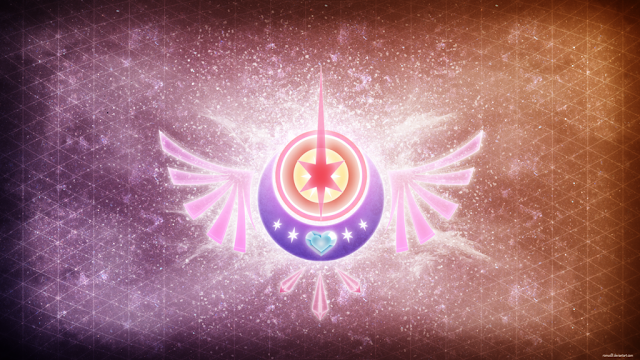 Discussion: What Job Would You Do if Teleported to Equestria? Good news! You've been teleported to Equestria. Bad news! You aren't that big a deal. Turns out a world filled with sapient magical creatures isn't that amazed at your presence as you thought. All those fanfics you read about a brony appearing in horseland and getting a royal stipend while he chills with Twilight were nonsense. How do your current skills translate over to this world? What will you do to make money? 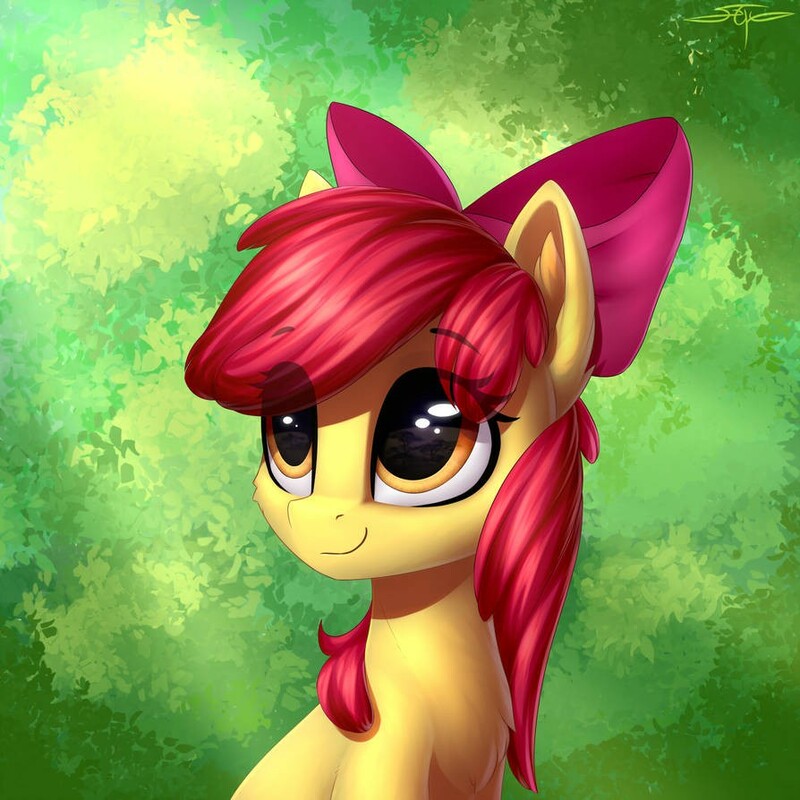 I never get to header anything with Apple Bloom. So have a simple portrait. And get lots of art below. Well, I certainly didn't expect that to happen. I guess in Equestria things like cheating have different consequences than in our world. Maturity Warning - Rogue Diamond is a little more mature once again. February. A bleak month for new comics. In that there are no new comics. So let's take a look back at a two-part story in which Ponyville wars against itself. Whose side are you on? I'm on the side of a review, with spoilers. Check it all out after the break! 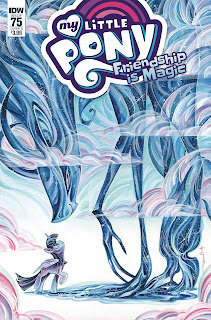 My Little Pony: Friendship is Magic has been officially announced for April according to the Discovery Family Instagram. 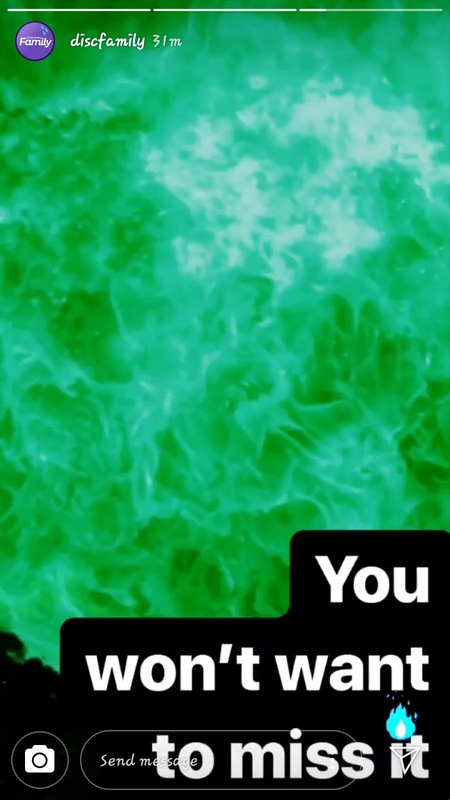 They dropped a trailer off to celebrate the occasion that reveals a few awesome new things to look forward to! Head on down below the break to check it out. Reminding of Vylet's most hard-hitting works and collabs such as the momentous The Watcher, Inequality or Cataclysm, this new collab from the new Homeward album showcases what happens when you mix in the musical talents of Vylet, The Living Tombstone and KLRX. Heavy, yet always with those cinematic vibes and that progressive aspect that make Vylet's pieces unique in the community, Swarm epicly conveys the corresponding part of the story in musical form, always detailled in the description! And as always you can read the full story from here! 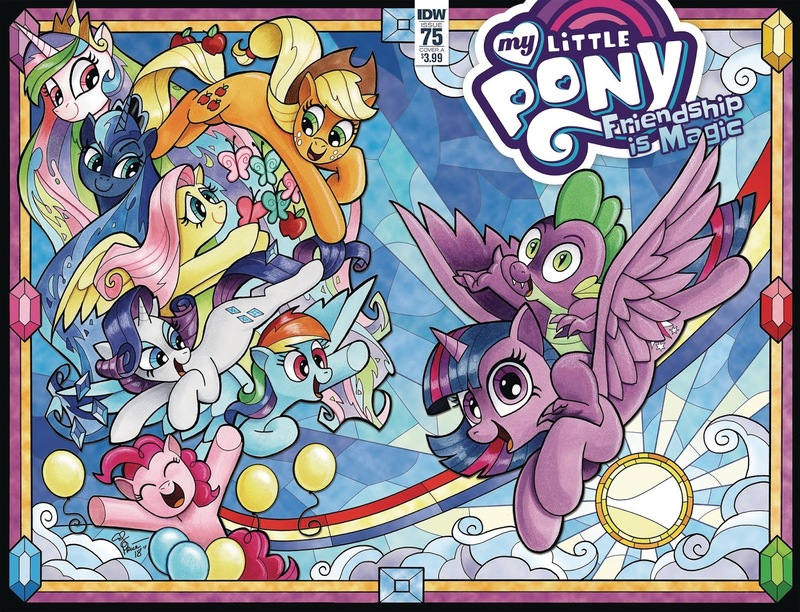 The 75th installment of the My Little Pony main series comic drops on the 6th of MArch, and iTunes now has a preview up for you all to check out. For the full reveal of this one, head on over to our main page for it. And get your pages below! 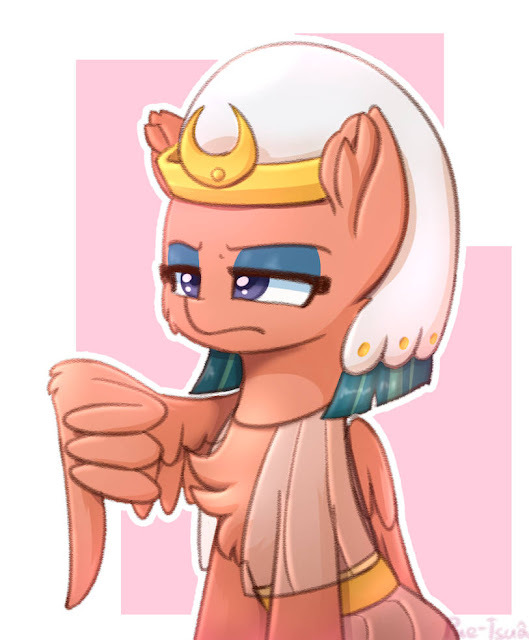 Somnambula is not amused and you don't want Somnambula upset with you. Morning gang! Everyone sleep well? 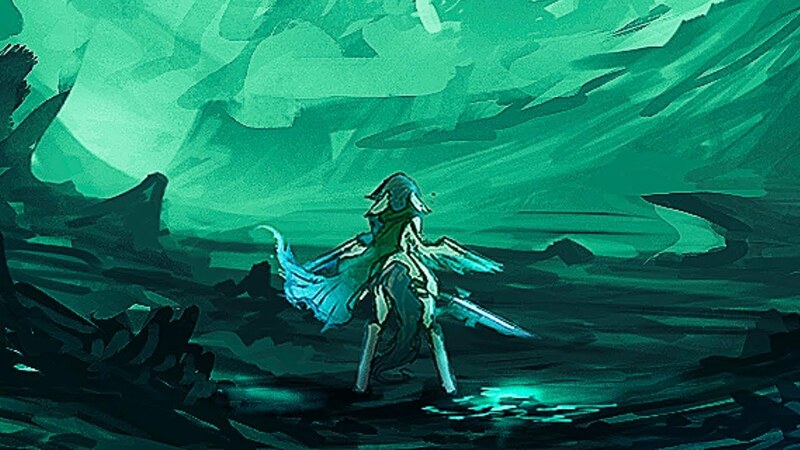 While we can't completely confirm that this is pony, the eyes and that little fire icon in the corner look pretty pony-ish. We've got a big reveal coming from Discovery Family at 9:00 AM MST. Will we get cartoon horses out of it? Or is it another show entirely? Start speculating below! 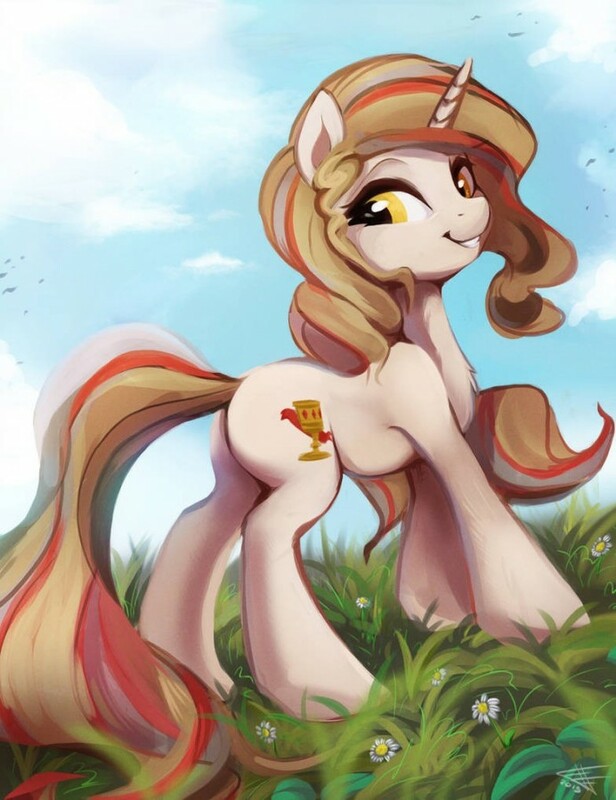 Personally I'm hoping for a MLP season 9 release date. We are due for one with April so close! Thanks to Akela and Brian for the heads up. 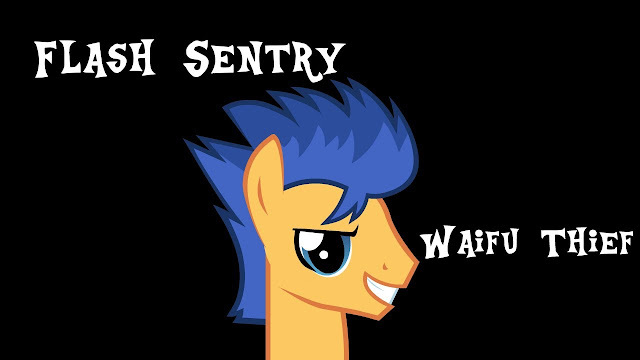 Flash sentry steals all the waifus. He tends to do that. Sad times. Get a new animation below. 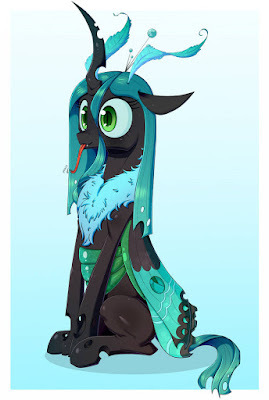 If this will be our reformed Chrysalis I think that will be ok. She looks pretty cool! Discussion: Pony DLC - Would You Pay to Get Your OC in the Show? It's a terror of the gaming world, and one of the most controversial topics of our time. The world of Pay2Win has taken over as mobile continues to grow and train a generation of little monsters in the art of swiping their parents credit card to have prettier digital goods than their friends. Whether it be dumping thousands into anime waifus in Fire Emblem Awakening or even our very own pony game with its $9.99 90% off sales, we are inundated by it. Lets dive into the hypothetical world where this blight has wandered it's way over the cartoons. Companies everywhere are charging and auctioning off slots in their shows for your very own characters. How much would you pay to get your OC in the last season of Friendship is Magic? What is your absolute cap? A new toy commercial apparently has this short Twilight sparkle with rainbow wings animation. The gif has started popping up on the internet. This is most likely based on those rainbow wing ponies from a few weeks ago that were announced for the upcoming Rainbow Roadtrip special. 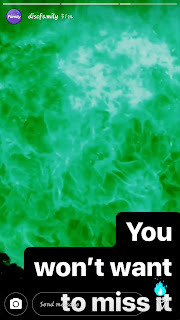 We don't have confirmation yet though, as it's just a gif from a supposed toy ad. More information to come if we do get it! Grab an awesome artist, and they can make any OC look amazing. 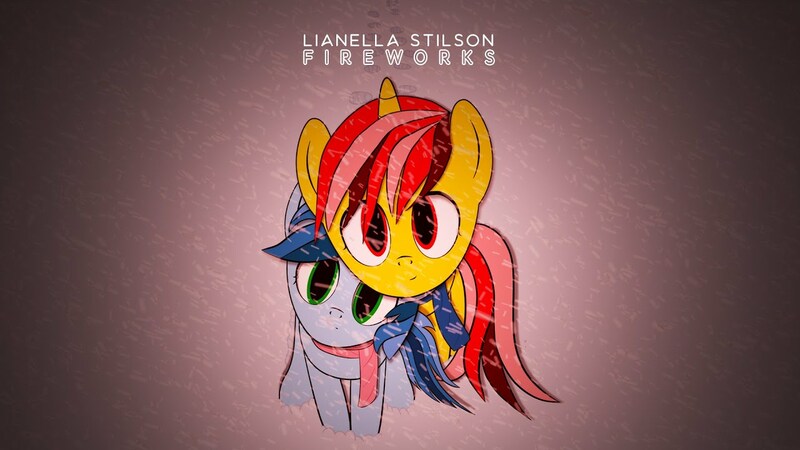 Another incredible music that is accompanied by an impressive animation, this is Lianella Stilson's song about two ponies watching fireworks, and they appear in the video as they're cuddling together and singing the words while watching fireworks! The vocals and sound design are much reminding of Trance greatness, while the heavy Dubstep drops are bringing in much hard-hitting-ness, but always with that sweet side to it. Pony Trance from Russia! Lots of other cool pony stuff all over Lianella's Bandcamp, check it out! 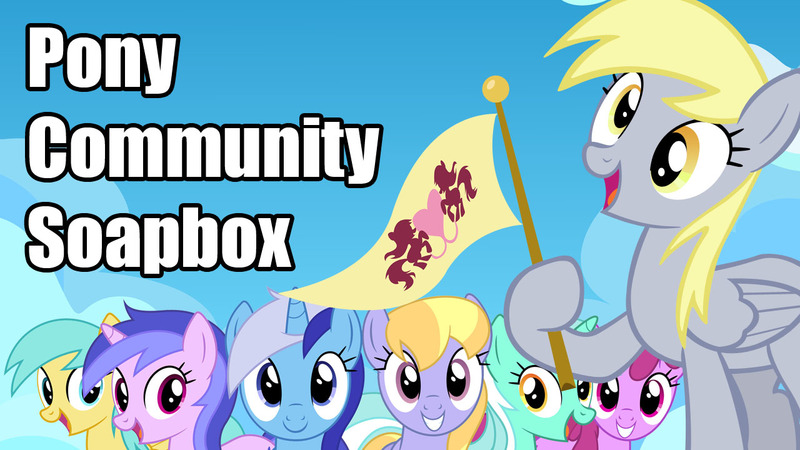 Pony Community Soapbox #130 - Character Obsession, Underrated King Sombra, and More! Why are people obsessed with their favorite characters? A new survey has arrived out of a discussion over on Twitter about conventions and the people attending them. It has now started making the rounds pretty much everywhere, with tons of con-goers submitting their 2-cents into the ring. Everything from price, guests, and NSFW content is included. Help con heads get an idea about who all is attending these things! Take the survey over here. 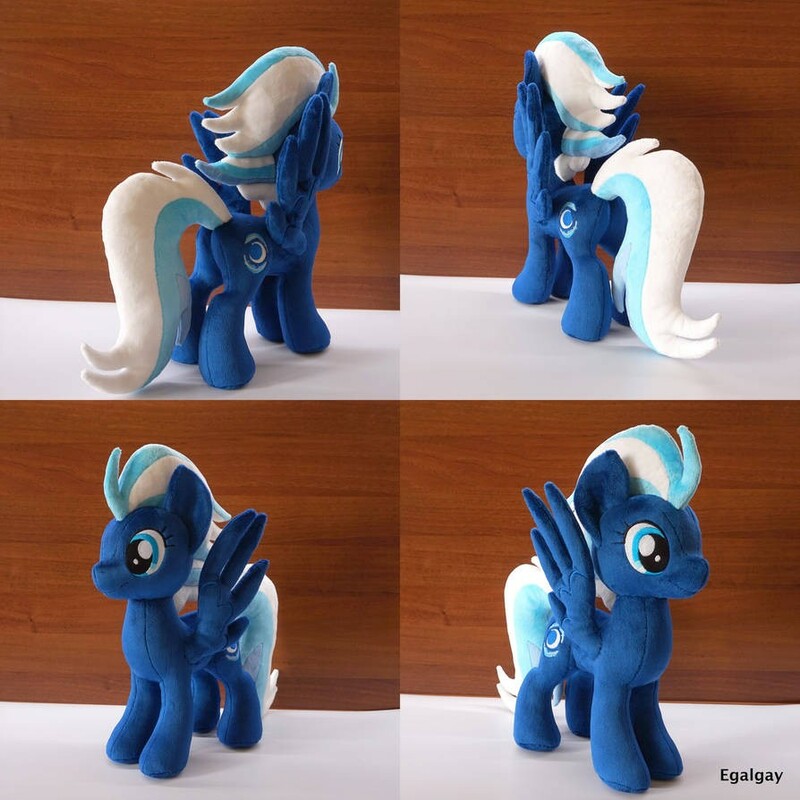 There are not nearly enough Night Glider plushies out there. Get a bunch of pones to go with her below! You won't ditch your OC after season 9, will you? Now here's the kind of fan works that I love to see. Dizzy Inmotion imagined a whole new storyline in an alternate version of the EQG world, and is making a whole concept album around it, enacting each story part in songs and even skits..! 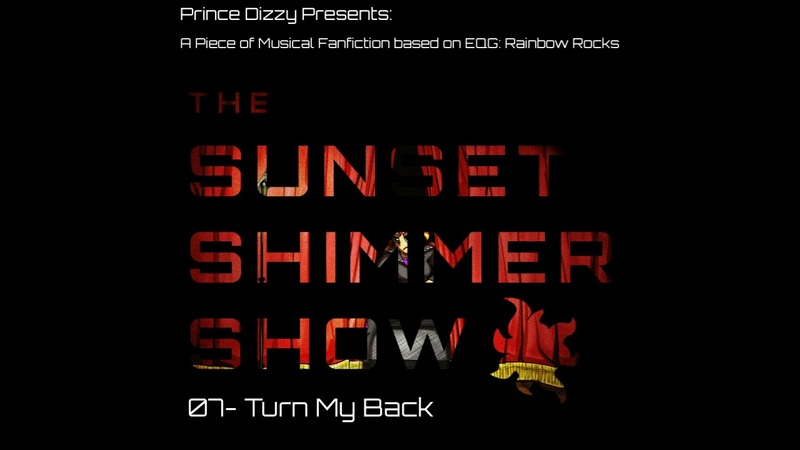 Released at the same time, Rainbow (Skit) features voice acting between Dizzy as Sunset and DaWillstanator as Rainbow Dash, and it's the story part that comes right before this one, Expectations, which is re-imagining that beloved kitchen scene from Rainbow Rocks with its own intro and song conveying much character depth. And it's a collab with Mystic Genesis! Catch up with previous parts of the story, with the very awesome Bad Girl, Don't Let The Sun Set, Vinyl (Skit), and Battle, all on Dizzy's channel! I highly recommend them! And be on the lookout for future releases from the album, and the release of the full album! It's Tuesday! 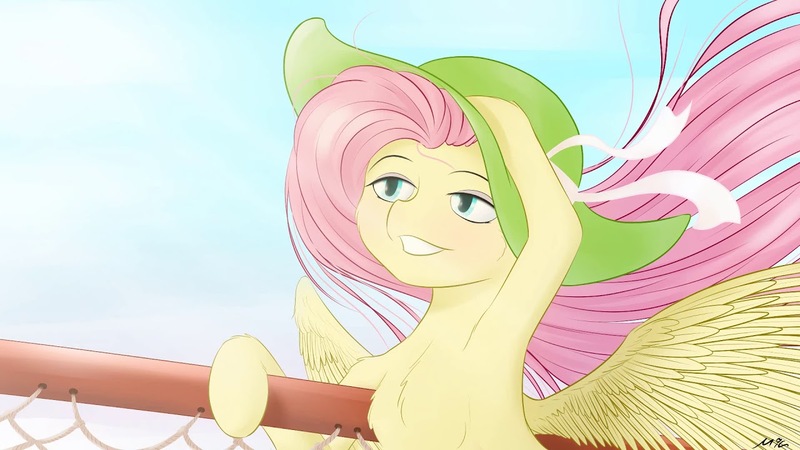 We should technically have another Friendship is Magic short today. If you missed the last few, you can find them all at the Episode Post tag. I might swap that to something else once the season starts, but for now these are episode enough. If it airs, it should be at 8 AM. 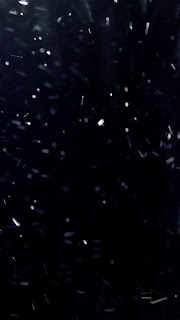 The embed will be swapped below when it does. I wonder who will be the focus this time? If you are bored while you wait, go draw a pony! All welcome. UPDATE: According to Big Jim this is the final short of this series. Poor Twilight. This meme is going to kill the poor girl. Morning everyone, hope you all slept well! 4everfreebrony has teamed up with the ever-talented EileMonty for a brand new disney-like Luna song. Because Luna is pretty much build for this stuff. More Pony Music! The ride will never end! More fan music from the community! Quality, awesome ideas, cool new versions, and a lot of great discoveries all around await you in this post! 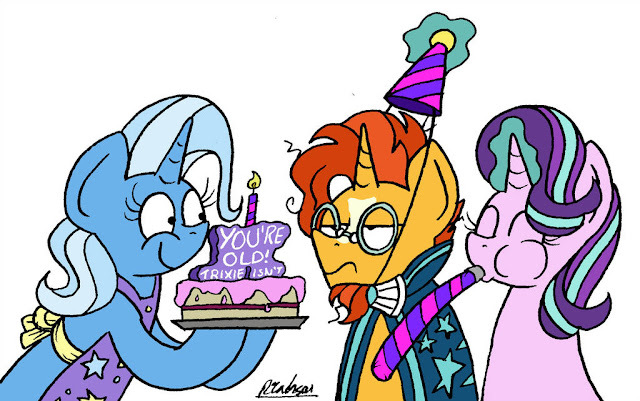 You've got to think on the positive side, Sunburst: at least they remembered it was your birthday. And they've got cake! Evening my friends, hope you're all doing well. 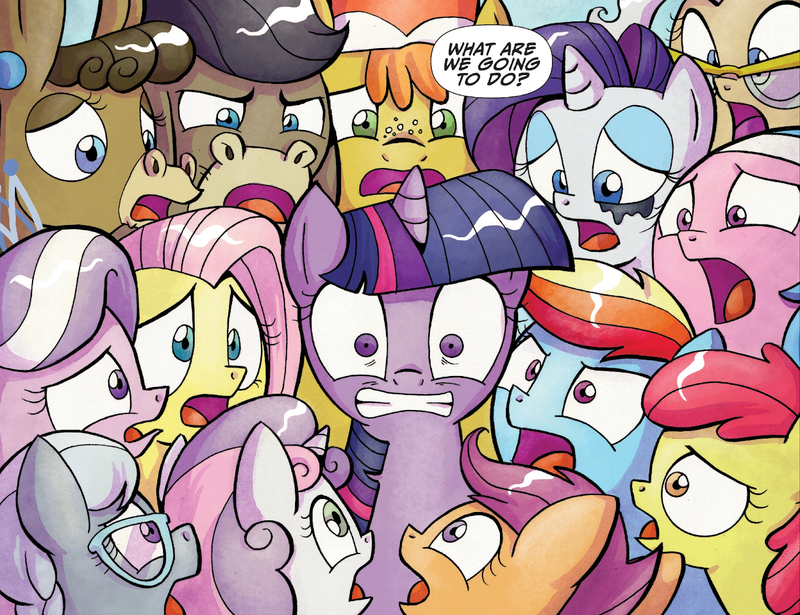 It's every young filly and colt's dream -- the moment they get their cutie mark. It is the instant they leave childhood behind. For Firecracker, getting his cutie mark was a dream come true. Literally: he woke up, and there it was. Now if only he could remember what his dream was about. 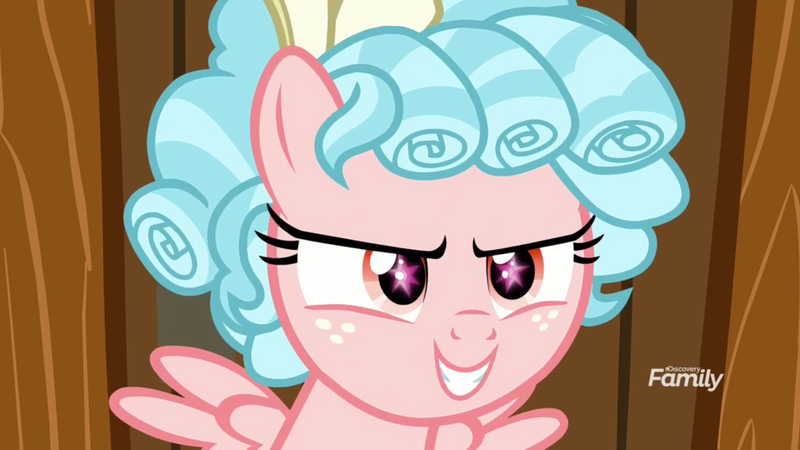 Discussion: What Does the Future Hold for Cozy Glow? I doubt we've seen the end of Cozy Glow. 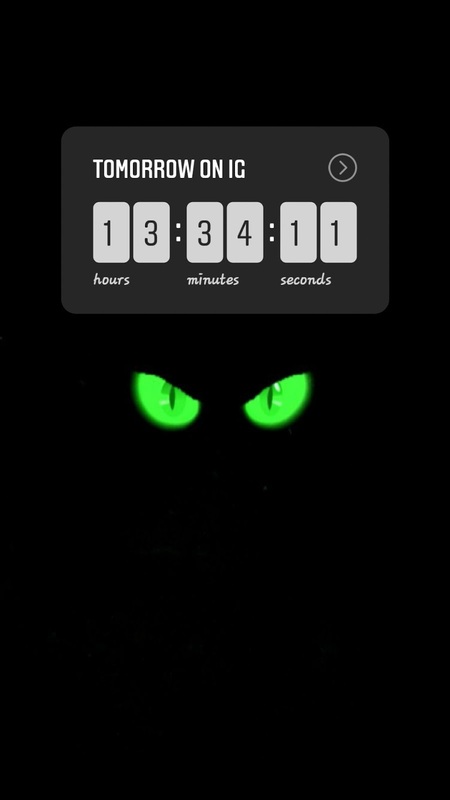 The little terror might be locked away in Tartarus, but who knows what she and Tirek are cooking up down there. Where do you want to see her story go? Is she a multi-dimensional creature of pure evil that corrupts worlds one at a time? Is she just a damaged filly from a terrible childhood? Is she a sociopath who wiped out her hometown and snuck into Twilight's school? Derpy Day Arrives on March 1st! Derpy Day arrives on March 1st coinciding with her annual "Derpy Appreciation Day". Our little fandom mascot has had quite a bit of love over the last year, and deserves more! Go draw her! Go make things with her! [email protected] is the place to send your stuff. Title the emails DERPY DAY followed by what it is, so DERPY DAY - OPEN ART for the open art compilation. Expect derpage when the day arrives. The calendar has been updated. 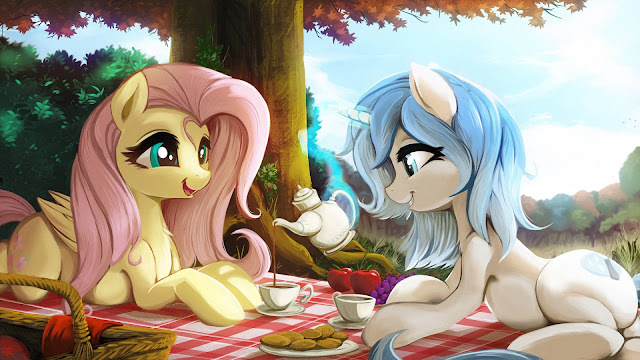 Our very first Chrysalis day is on the 4th of June, coinciding with Cheese Day because she has cheese legs and insect and love themed days were on top of other days. Yes, this is a discussion that happened over the course of an hour. EQD is a magical place. 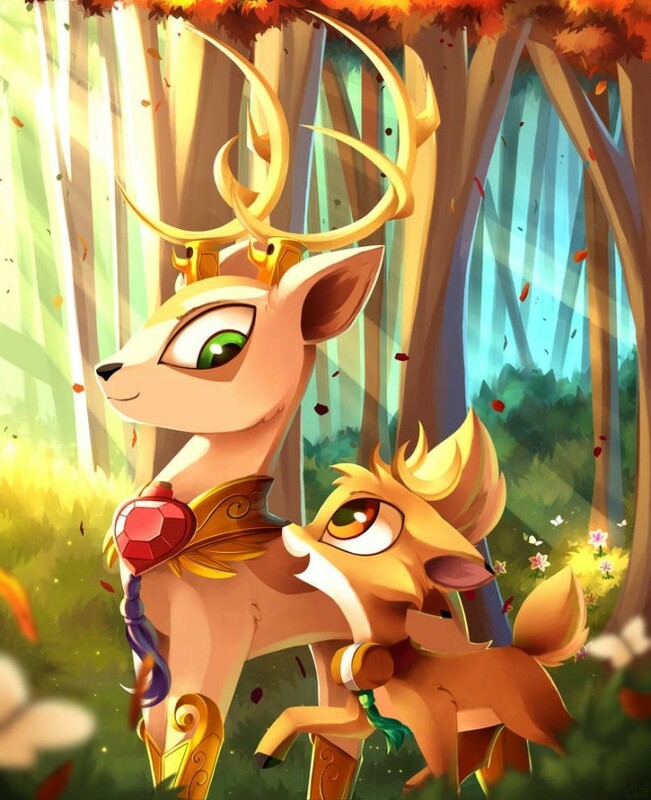 Should the deer make a return for season 9? We never did get a whole lot with them. Hasbro has teamed up with the miniatures company WizKids for a new line of figures for three of their big brands, including pony. They don't have images of what we should expect yet, but their already-existing catalogue is pretty extensive. These will come in both painted and unpainted versions, so you can most likely paint them like your OC. 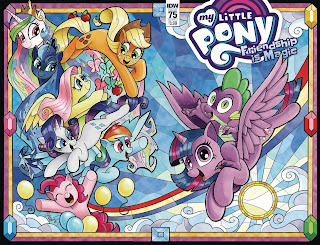 I suppose this means Tails of Equestria is getting an upgrade? There isn't an announced date yet outside of "Later this year". Expect updates when we get them. Thanks to Lucas for the heads up.